Above: The B-52 was ordered by SAC for it's primary mission: deterring nuclear attack. The Stratofortress and their crews were on alert 24 hours a day, seven days a week. They protected America while she worked, played and slept. 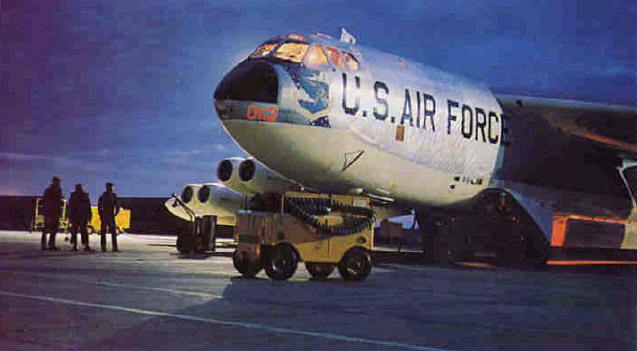 The above picture shows a shiny B-52 of the early 1960s. During the Vietnam era, the planes began getting camouflage paint schemes. For more than a half century, B-52 Stratofortresses have been the backbone of the manned strategic bomber force for the United States. The bomber is capable of flying at high subsonic speeds at altitudes up to 50,000 feet (15,166.6 meters). The use of aerial refueling gives the B-52 a range limited only by crew endurance. It has an unrefueled combat range in excess of 8,800 miles. It can carry nuclear or precision guided conventional ordnance with worldwide precision navigation capability. Updated with modern technology the B-52 will be capable of delivering the full complement of joint developed weapons and will continue into the 21st century as an important element of our nation's defenses. The B-52A first flew in 1954, and the B model entered service in 1955. 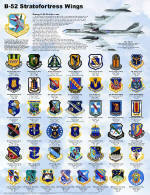 A total of 744 B-52s were built with the last, a B-52H, delivered in October 1962. Current engineering analyses show the B-52's life span to extend beyond the year 2045. During the Vietnam period, it acquired its popular nickname, "Buff" - Big Ugly Fat Fella, but some maintain the second "f" stands for something else.